Sunday October 19th marked the culmination of what is regarded as one of the most unique astronomical events to take place in human history – so unique, some commentators believe it may only happen once every million years or so: the opportunity to study something which may have existed before the Earth was created. 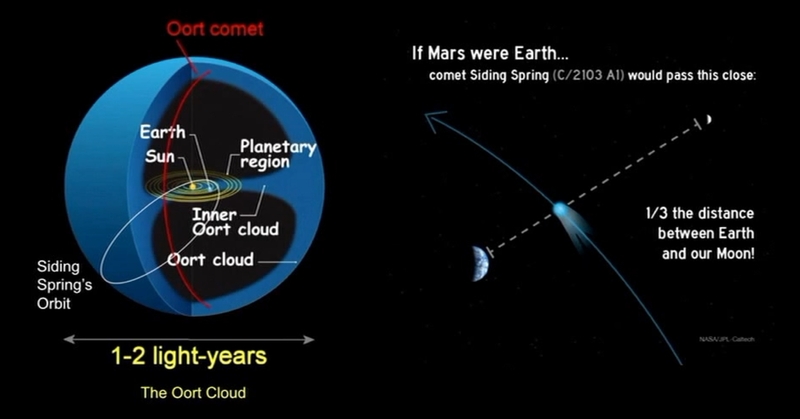 For the last several months, comet Siding Spring has been under observation as it hurtles through the solar system at an acute angle relative to the plane of the ecliptic – the imaginary line along which the planets orbit, and on Sunday October 19th, it made its closest approach to Mars, passing just in front of the planet relative to the Sun. Siding Spring was first identified by Australian astronomer Rob McNaught, and bears the name of his observatory as a result, although officially it is catalogued as C/2013 A1. Since then, it has been under observation from a veritable armada of international space craft, and its passage past Mars presents further unique opportunities for observation and data-gathering. The comet has been identified as coming from the Oort cloud (or the Öpik–Oort cloud, to give proper recognition both astronomers who initially and independently postulated its existence). This is a spherical cloud of debris left-over from the creation of the solar system, occupying a huge area starting some 2,000-5,000 AU (2,000 to 5,000 times the distance from the Earth to the Sun) and extending out to around 50-100,000 AU – or about one light year away. Thus, Siding Spring represents some of the material “left-over” from the formation of the solar system 4.6 billion years ago – older than the Earth itself. In fact, such is the distance of the Oort cloud from the Sun, that some postulate the much of the material within it may actually come from stars which shared the same “stellar nursery” as the Sun. There is nothing unique per se about comets coming from the Oort cloud – it is one of two places from which all comets originate, the other being the Kuiper belt (or Edgeworth–Kuiper belt, as it is also known in recognition of the two astronomers to postulate its existence in the form we now know it has). A disk of material also from the early history of the solar system, the Kuiper belt orbits the Sun at a distance of around 30-50 AU, and gives rise to “periodic” comets. These are comets which circle the Sun in periods of up to 200 years. Two of the most famous Kuiper belt comets are comet Halley, with it 76-year orbit, and comet Shoemaker-Levy 9, which broke-up during a close approach to Jupiter in 1992 prior to colliding with the gas giant in 1994. The chance for scientific discovery notwithstanding, the comet’s path was initially a cause for concern, at least in terms of Mars’ future. Early attempts to track the comet’s likely route “up” through the solar system suggested that rather than passing the Red Planet, Siding Spring would in fact smash into it. Had the comet struck, estimates suggest it would have created a crater between 10 and 15km in diameter, depending on the actual size of the comet’s nucleus, thought to be between 700m and 1km across. 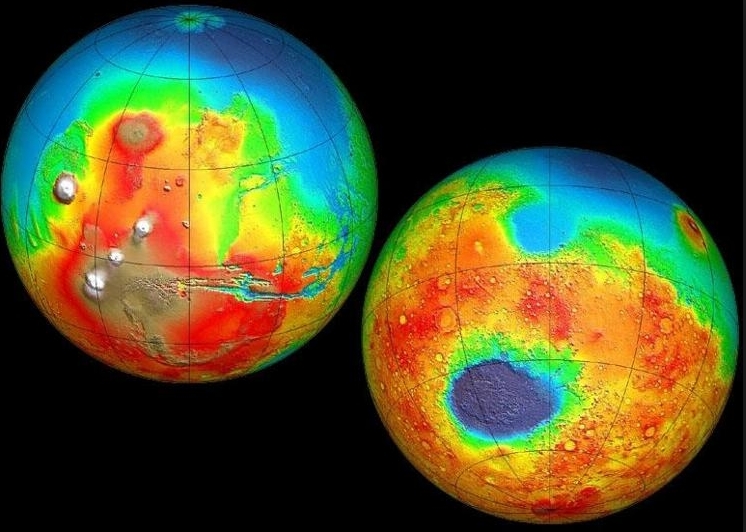 While that is certainly enough to result in quite an extraordinary bang and some severe changes in the Martian atmosphere (not to mention the sizable dent it would make in the planet’s surface), Mars has actually withstood much larger impacts in its time. Take Hellas Basin, for example. It is the largest visible crater in the solar system, some 2,300km (1,440 miles) across, and with an ejecta ring some 7,000km (4,375 miles) across. It is believed to have been created by the impact of an asteroid some 400km (250 miles) in diameter. 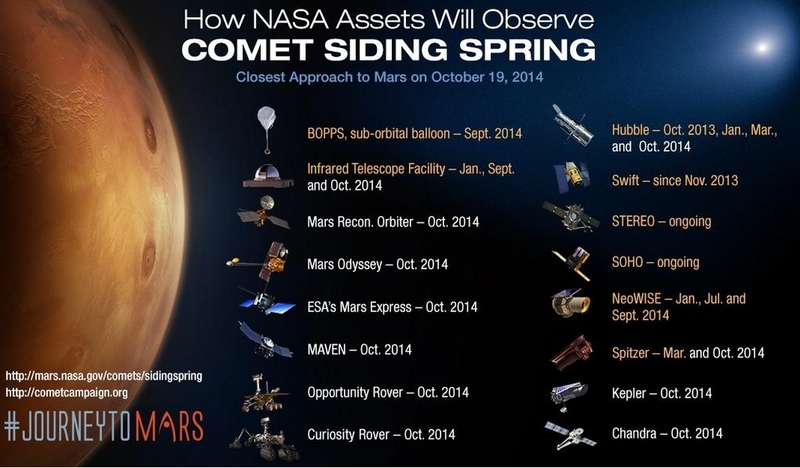 As Grunsfeld noted, such is the scientific opportunity presented by the comet, that NASA has put a significant number of assets in the front line of tracking and observing Siding Spring. These include the Hubble Space Telescope, the Spitzer infra-red space telescope, the WISE infra-red space telescope, the Chandra X-ray observatory, the Kepler orbital observatory (used in the search for Earth-sized extra-solar planets) and more, as well a host of ground-based observatories. Foremost in the front line, by dint of the comet’s close passage past Mars, are NASA’s orbital and surface vehicles there. Curiosity, Opportunity, the Mars Reconnaissance Orbiter (MRO), Mars Odyssey and MAVEN, together with Europe’s Mars Express and India’s MOM, are all watching the comet, although for the orbiting spacecraft, this comes with a degree of risk. Because the comet is so close to the Sun, it has formed the familiar coma and tail of dust, gases, water vapour, etc., given off as a result of solar heating. Both are actually quite dense, and as the particles causing them are travelling at such high velocities, they could cause severe damage to any vehicle encountering them. Fortunately, most of this risk is mitigated by the distance the comet passes Mars – around 132,000km (82,000 miles) from Mars, far enough for the the densest parts of the coma and tail to “miss” the planet, thus posing no threat to orbiting vehicles. However, there is a risk of material ejected earlier in the comet’s approach presenting a potential danger to orbiting craft. Some of this material has been found to be travelling at twice the anticipated velocity following its ejection from the comet, and is expected to reach and interact with the planet’s atmosphere. Because of the nature of things, this material is expected to arrive at Mars about 100-130 minutes after the comet has made its closest approach to the planet, and the danger it presents means that orbiting vehicles above Mars will perform a “duck and cover” operation. This means that the vehicles orbiting Mars have all had their tracks adjusted so that they can observe the final phase of the comet’s close approach before their adjusted orbits put them “behind” Mars, using its bulk to protect them as this additional material sweeps by after the comet has already passed. They’ll then “pop up” once more to observe the comet’s departure. This additional material from the comet is expected to more than double the amount of hydrogen in the high reaches of Mars’ atmosphere for a period lasting some tens of hours. This will in turn warm the upper atmosphere by up to 30 Kelvin for several hours, causing it to expand sufficiently to increase the amount of atmospheric drag encountered by NASA’s MRO and MAVEN vehicles. Neither vehicle is in any danger of being dragged down into the atmosphere and burning up, but the change does offer a signficant opportunity for further atmospheric study – precisely the job MAVEN was designed for. With Curiosity also observing from the surface of the planet, the Mars scientists looks to be in for a special treat of their own, on top of whatever else Siding Spring delivers to the science community as a whole. Once it has passed Mars, Siding Spring will move above the plane of the Ecliptic, effectively starting it long, lonely climb “up” and out of the solar system, . SpaceX, the commercial space enterprise founded by Elon Musk has been in the news a lot. They’re currently engaged in flying uncrewed resupply missions to the International Space Station aboard their Dragon v1 vehicle; they’re in the running to ferry US (and international) crews to the ISS with their Dragon v2 spacecraft starting in 2017; and they’re working towards developing a fully reusable, rocket-based launch system based on their successful Falcon 9 launch family. Now they’re helping NASA gain potentially critical engineering data which will help future human missions to Mars. So far, the heaviest payload successfully placed on the surface of Mars is the one tonne Curiosity rover. However, as remarkable is this was, it pales into insignificance compared to trying to safely place a crewed vehicle potentially massing as much as forty tonnes (depending on the type of mission flown) on the surface of Mars. Such a massive vehicle, travelling at around 40-45,000 kp/h (26-28,000 mph), is going to take a lot of slowing down in order to land safely, which in turn is going to require very clever usage of the tenuous Martian atmosphere. As I’ve noted in previous MSL updates, NASA has already engaged in various means of assisting in the task of slowing a crewed vehicle entering the Martian atmosphere through the use of inflatable deceleration systems designed to increase the amount of atmospheric drag created by the craft, and the ongoing development of supersonic parachutes which can be opened at much higher velocities, further helping to slow a craft down. A third opportunity for slowing a vehicle – albeit one that is mass-dependent – is the use of rocket motors within the planetary atmosphere. 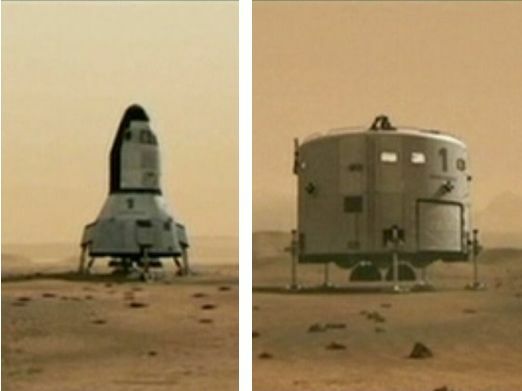 This isn’t actually a new idea; small-scale rocket motors with a limited fuel supply have been used on Mars missions already: the two Viking Landers of the 1970s used retro-rockets in the final few metres of their descent prior to touch-down, as did the Mars Phoenix mission of 1998. The MSL mission used rockets to hold the “skycrane” in a hover as it winched Curiosity down to the ground in 2012. However, the use of rockets to slow a spacecraft through re-entry into the upper reaches of an planetary atmosphere in what is referred to a “retro-propulsion”, is largely unknown territory (while the shuttle could fire its OMS engines to slow itself in preparation for re-entry into Earth’s atmosphere, it did not use its engines during or after re-entry). Enter SpaceX. As a part of their plans for their reusable launch system, they are developing a first stage of their Falcon launcher which can return to Earth and make a safe (vertical) landing at a designated location. This involves using the rocket engines in the first stage to bring the rocket through a controlled entry into the Earth’s atmosphere, then help decelerate it. Several tests on the Falcon launcher first stage have already been carried out by SpaceX through 2013 and 2014 to measure engine performance and effectiveness both during simulated landing operations and during actual re-entry into the Earth’s atmosphere, the part NASA is particularly interested in. On September 21st, 2014, SpaceX carried out a further retro-propulsion test with the first stage of a Falcon 9 rocket which had been used to launch a Dragon resupply mission to the ISS, and NASA was on-hand to gather data. Flying two specially equipped aircraft, the US space agency captured video, thermal, and other information on the Falcon launcher’s first stage as it went through a controlled re-entry into Earth’s atmosphere and a period of retro-propulsion through a region of atmospheric density approximate to the kind a vehicle would encounter when using retro-propulsion within Mars’ atmosphere. It may not look much, but it’s a significant step towards better understanding flight dynamics on the road to Mars – and “piggybacking” their observations on the back of SpaceX’s work is potentially saving the US space agency tens of millions (or more) in the development of flight test hardware. All images and graphics courtesy of NASA / JPL unless indicated.